How many route choices did you see for the long leg on Courses Red 1 and Red 2 (see featured image) today at Cooleman Ridge? How was your time compared to your friends. Check the splits published on line and compare. Which way did your colleagues go? 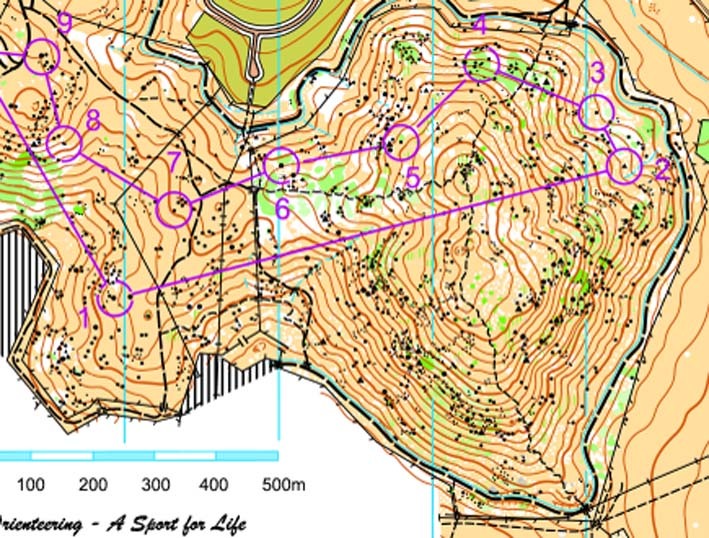 Even if you did not have it on your course have a look now and see if you can find at least 3 and maybe 5 or even 6 route choices from number #1 to #2. Having trouble thinking of different route choices? Well try this quick rule: Look Left, Right and Straight Ahead. C. Head to #6 and then contour all the way around to about #3 before dropping down to #2. You get a sneak preview of #6 and #3 on the way which might help later. D. Similar to C but contour higher at about the level of #4. Thicker vegetation, more climb, but a bit shorter. E. Head towards #6, but continue down and follow easily along the aqueduct. This is a ‘wide” route and longer but much easier and quicker. At about #3 you can gently climb to #2. This was the choice of the elites and those who can run fast. F. Can you see the far-right route all along the track? There is almost no climbing at all (except just near the control). Although it is much longer it could be a good choice too. So next time you see a Long Leg pause at the control for a few seconds longer and just like the politicians did on Friday ask yourself: Left, Right or Straight Ahead?